First I needed a tray. Well I discovered that I'd thrown out all the plastic trays that you get when you buy a flat of flowers so I improvised using a Gatorade holder. The plastic you see used to be on the outside of the cardboard and it wrapped up over the Gatorade bottles. Since I had to line it anyway what the heck just might as well use that plastic since it's already the right fit. I did use some duct tape to hold it up against the sides though. 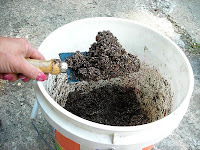 Next was to prepare some soil. This was not an exact science and to be honest I'm a little confused as to what type of mixture of what medium should really used since I've read several different combos that have been posted here and there. So I came up with a concoction which seemed ok to me. I used 2 parts perlite, 2 parts peat moss, 1 part potting soil, and 1 part sand. I think I was suppose to use a sharp sand, but all I had on hand was "general purpose" sand which is pretty course. I mixed it up in a bucket then added about 1.5 parts of the measuring container of water and mixed until completely wetted. 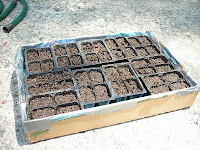 Then troweled the mixture into the 4-pack plant containers. I tapped the containers on the ground to settle mixture then added a bit more to top them off. By what I read the clipping you use should "snap" when bent rather than just bend over and it shouldn't be woody. Of course in the end I wound up with propagations samples of everything possible, but for sake of trying to keep with the protocol of what I read about I'll use the correct propagation pictures. 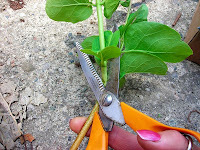 I'm cutting the clipping well below the part I'll need mostly for the aesthetics of the bush. 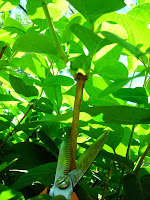 The two stems coming off the woody part is what I'm going to plant after I remove the lower leaves leaving about 1" of stem below the first set of leaves. Then I wetted the ends in water, shook, dipped in the hormone rooting stuff, tapped off the excess on the side of the hormone container then stuck the cutting into the prepared trays. At first I had a lot of leaf and stem but then decided to trim the tops off the tall ones since I didn't want the plant to waste energy trying to get nutrients all the way up there rather than working on creating a root ball. 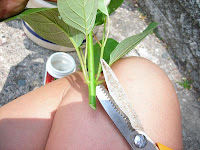 I also cut the larger leaves in half for the same reason plus I didn't want them shadowing the smaller plants from light. 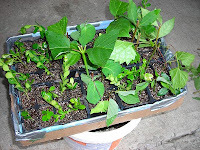 Of course I started with the intent of only experimenting with propagation of Red Twig Dogwood and Boxwood, but that soon escalated into a Myrtle sample, a few Burning Bush samples, some wild ivy for good measure and that little red/pink plant in my front yard which I can't remember the name of. I decided that my box needed some posts to hold the plastic up once it was covered so I broke some of my bamboo steaks to the same height and duct taped them into the inside corners of the box. 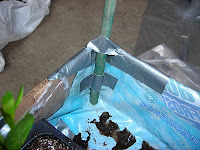 I later discovered that despite coving the sharp tops of the posts the plastic still might get ripped so I added a piece of duct tape to the inside of the bag where the post would rub. I'll probably have to redo that part since it'll probably get a hole eventually. 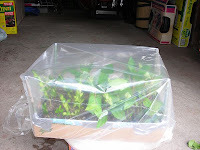 I gave the "tray" a little bit of a water sprinkle from the watering can and misted the leaves before covering the with the plastic bag. I secured the end of the bag to keep the moisture in. I put the tray in a spot that I knew would get a lot of light but no direct sunlight. 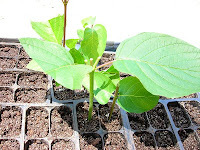 It should take at least 3 weeks before any rooting takes place and really 3 months before they can be moved. Winter presents a whole new problem. 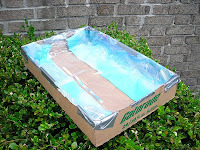 Do I need to build a cold frame?